Today I'm posting two stories for the price of one...Oh, that's right, they're Public Domain stories and free for the retelling and publishing, but I'll give full credit to the folklorists keeping these stories alive and known. 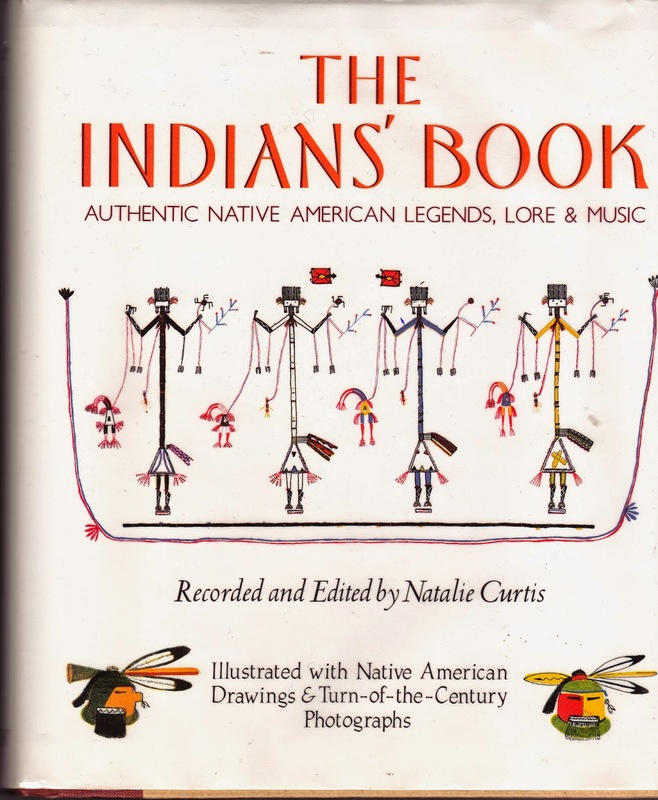 Natalie Curtis created a lovely look at not only Native American stories, but also music in The Indians' Book. Her recording of the music in Standard Music Notation offers songs as a major part of the book. There's also an index to her collection of stories and music of the Wabanaki, Dakota, Pawnee, Cheyenne, Arapaho, Kiowa, Winnebago, Kwakiutl, Pima, Apache, Mojave-Apache, Yuma, Navajo, Zuni, San Juan, Acoma, Laguna, and Hopi. I used the names she used for these nations as the exonyms (names given to the people by others) are better known, even though I know autonyms (names for themselves) may exist. For example Winnebago is more than the name of a recreational vehicle, it's often used for the Ho-Chunk or Hocąk people. 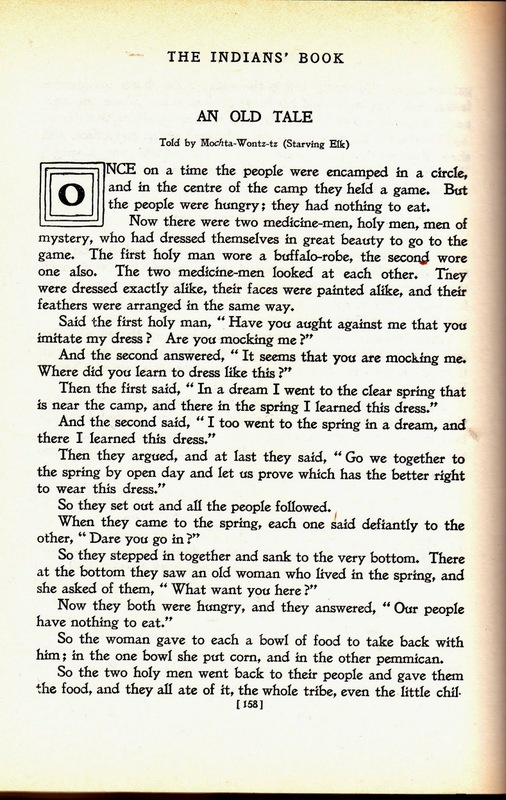 In most cases the autonym means something along the line of The People, or in the case of the Ho-Chunk or Hocąk, translations include: "the fish eaters," "the trout people," "the big fish people", "the big speech people," "the people of the big voice," "the people of the parent speech", and "the people of the original language." Current elders say it means, "the people of the big voice" or "the people of the sacred language." Here in Michigan our People of the 3 Fires, the Anishinaabe, are given multiple names, but their exonyms of Chippewa or Ojibway, Ottawa, and Pottawatomie are the better known names. 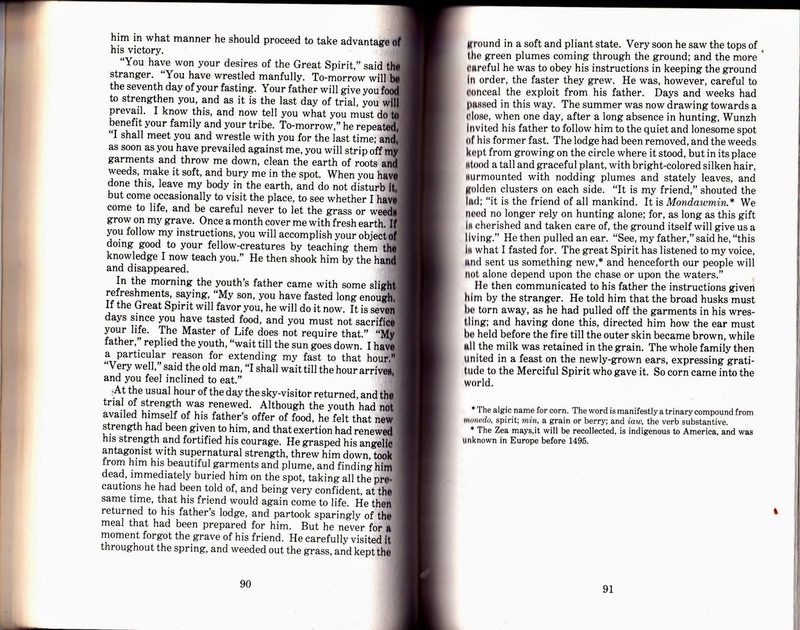 Today I'll again include one of the Schoolcraft Anishinaabe stories since the Cheyenne tale in Curtis's book is typical of many Native American stories telling how food and especially corn became available. Henry Rowe Schoolcraft fell in love with Michigan, the other Great Lakes states, and the Anishinaabe through his work as surveyor and later Indian Agent and, not least, his marriage to Jane Johnston, also known as (Obabaamwewe-giizhigokwe in modern spelling), meaning "Woman of the Sound [that the stars make] Rushing Through the Sky." At some time in the future I'll do a look specifically at their work since so little attention seems to be given to our own Native people and their folklore. The better known western Native American nations are included in Ms. Curtis's book, but not our own area. In the future when I look at the Schoolcrafts I will be sure to include Jane's contribution since it has been overlooked for too long and was critical to her husband's work. Yes, for now, I'll use her shorter name. Natalie Curtis is quickly summarized by Wikipedia, but I hope you'll also look at the more detailed, Center for American Culture Studies organization devoted to Natalie Curtis. Through that site you will discover that music was her main focus, explaining the reason it's such a large part of The Indians' Book, her involvement with early 20th century composers like Percy Grainger who used folk themes in classical music, and how her work led to the creation of Ferruccio Busoni's "Indian Fantasy." I can't resist a picture here of her collecting music using an old wax cylinder recorder. Better living through technology happened even before computers! 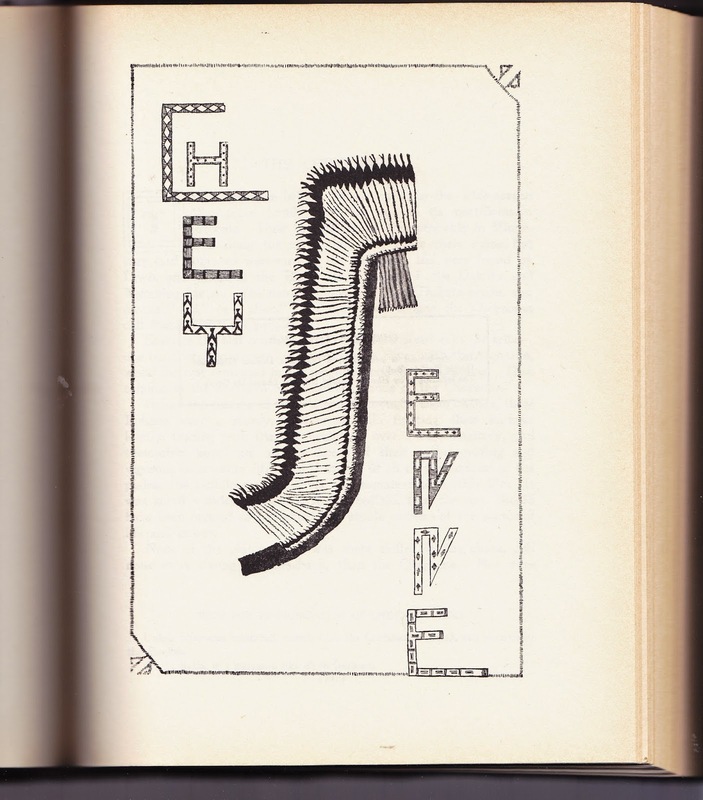 The innovative title page designs for The Indians' Book came about in an unexpected way. To provide designs for the section title pages, Curtis had collected original artwork on paper from contributors of many tribes. She asked DeCora to make a design for the Winnebago title page. DeCora created a beadwork design for the page as requested, but she also included the words "Lake Indians -- Winnebago" in lettering that matched the rest of the design. Curtis described the lettering as "beautiful" and of "startling originality." 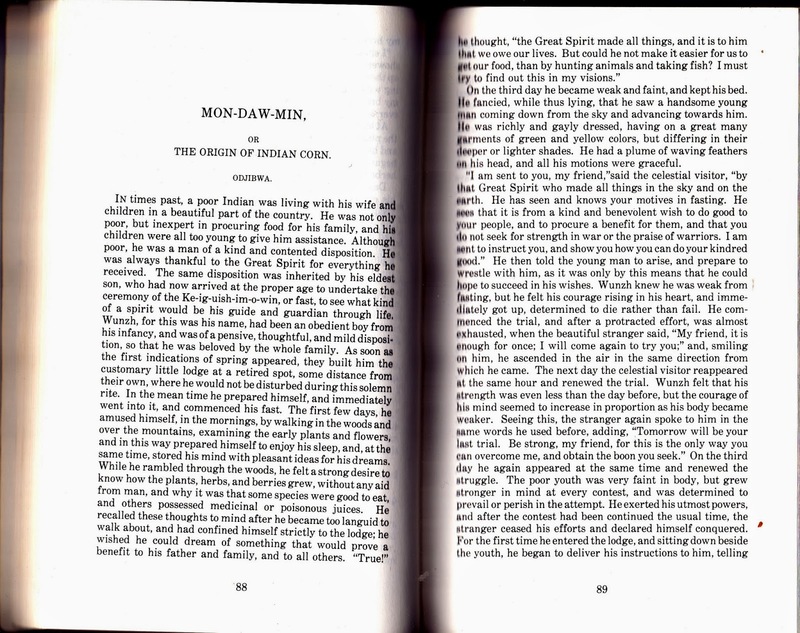 and, finally the story -- which has no music, since not all stories in The Indians' Book do. George Bird Grinnell's By Cheyenne Campfires is a major look at Cheyenne folklore. It has a 1926 copyright, but the Hathi Trust Digital Library says it's in Public Domain. Maybe I'll later dare to go beyond the safe Public Domain date of 1923 and include a story from it. Here is how receiving corn is told in Michigan as collected by Jane and Henry Rowe Schoolcraft. The Schoolcraft book goes by more than one name, but can easily be found at Project Gutenberg, as written by H.R. Schoolcraft, The Myth of Hiawatha, and Other Oral Legends, Mythologic and Allegoric, of the North American Indians. Leave it to a 19th century folklorist to have a title like that. Unrelated to today's story, if you're wondering, yes, Henry Wadsworth Longfellow's epic poem, "The Song of Hiawatha", was inspired by the work of the Schoolcrafts, but memorializes a mistaken name for the Anishinaabe "trickster-transformer" commonly called Nanabozho. Since Hiawatha was an Iroquois name, I'm sure it could easily be called a bit of continuing the trickster heritage. At the risk of being called "corny", I love the way the boy brings corn to save his people after a vision quest, how he battles with the stranger, then endures a whole year of seeming failure, while he tended the "grave", and finally the gift of Mondawmin is revealed and makes people less dependent upon hunting and fishing, while developing an agrarian society. What's the first foreign country south of Detroit? -- a trick question I love because it shows how close this part of the U.S. is to its neighbor, Canada. Many of my readers live near Canada, so watch for Mondawmin Road when traveling east out of Sarnia if you take the Port Huron entrance into Canada.